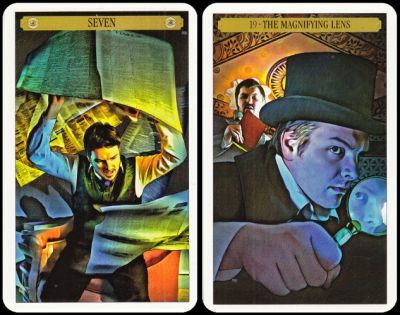 As far as I know many people tried to design a pack of tarot dedicated to Sherlock Holmes but until now only one has been published. This tarot designed by John Matthews and Wil Kinghan does not follow the Rider-Waite-Smith pattern neither the Marseilles one. To match better the work of Arthur Conan Doyle, the four suits are Observation (eye), Evidence (footprint), Analysis (magnifying glass) and Deduction (question mark). The 22 trumps have been renamed from Inspector Lestrade (0) to the London Times (21). A 79th card has been added, not the happy squirrel but the giant rat of Sumatra, mentioned in the Adventure of the Sussex Vampire, 1924. All the illustrations look like from popular book covers and the characters are presented in the Victorian London's shadowy buildings and fog-bound streets. Price and where to find: Less than £ 20, with a 160-page companion book.